Interested in High Quality Paints? Spray paint is used everywhere: on vehicles, for wooden projects, on the ground for roadwork and utility marking, and much more. Spray paint comes specialized for different materials and purposes, too. You can purchase paint specific for metal, glass, plastic, and various automotive applications; it can be used for countless jobs such as decorative, rust prevention, and color coding, just to name a few. To efficiently complete the task at hand, ensure you use a high-quality spray paint. Not sure what to look for in a great spray paint? Don’t rely on the price. With spray paint, especially, a lot of times you are paying for the brand instead of the quality. Spray paint is made up of solvents (the fluids) and solids. Superior quality paint typically contains a higher solid to solvent ratio. Because of this, high solids spray paint provides increased coverage and, when the paint includes pigment, a better hide. 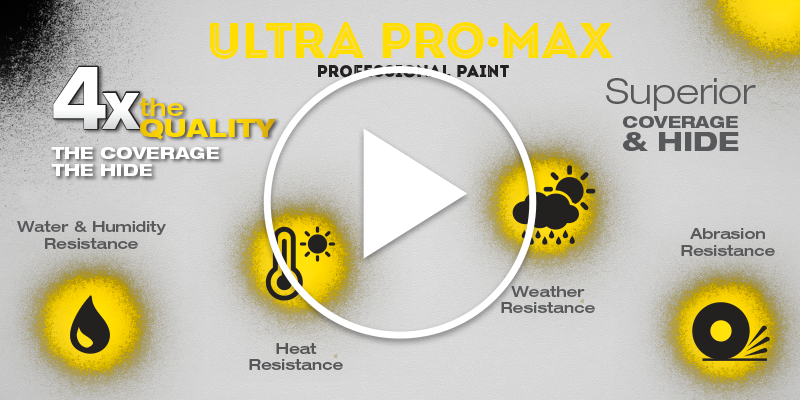 When using a high solids paint, there is also less overspray. Coverage is the amount of surface area that is covered per unit of product. Typically, the higher the solid to solvent ratio in a spray paint, the greater the coverage. A high-coverage paint will last longer and complete more of a project than a low-coverage paint. Hide refers to the relative ability of an applied coating to hide the underlying surface with the coating’s own color and characteristics. Hide can be a very critical part in determining the right paint; it can be the difference between one coat of paint or two. However, not all high-quality spray paint hides the underlaying material. Consider, for example, a clear, colorless finish. When you’re working in a shop, it’s impossible to keep contaminants from flying around – a perfectly clean room (without a paint booth) is unattainable. That is why fast dry times can greatly affect the quality of a paint job, and therefore the quality of the project. Depending on the paint, set-to-touch dry times can be as quick as three to five minutes. When deciding on the right spray paint, consider the material of the project you’re working on. Certain spray paints are designed to be more flexible, therefore they will hold up better on a flexible material. For example, if the object you are painting is a plastic bumper, there are specific spray paints that are designed to handle a plastic bumper’s level of flexibility. Any paint coating is first and foremost a protective finish. On metal, paint protects against rust, corrosion, and other deterioration. On wood, paint can protect against rot and weathering. Regardless of how well a paint finish will apply, how easy it is to spray, how well it covers and hides, or how quickly it dries, a paint finish that doesn’t hold up over time and under stress will fail to perform its prime function – to protect the surface it is applied to. A paint finish that breaks down under exposure to sunlight, scrapes off under abrasion, peels under exposure to weathering, is attacked by chemicals, or chips away due to vibration, denting, or bending cannot be a good value because it won’t last in the long run. Consider this list the next time you are in search for the perfect spray paint for your project. The right paint can ensure a high-quality and long-lasting finish to any project. For more updates and tips to make your job easier, subscribe to the Kimball Midwest Blog.